This year Her Majesty Queen Elizabeth II celebrates her Sapphire Jubilee – the first ever British monarch in history to do so. To mark the occasion, a brand new British Isles £5 Proof coin has been issued featuring a sparkling sapphire crystal as a truly fitting tribute to Her Majesty’s record-breaking reign. The 1953 crown was issued to celebrate Her Majesty’s Coronation and was the very first UK commemorative coin to be issued during Queen Elizabeth II’s reign. Unusually, the obverse portrait features an engraving of the Queen riding on horseback at the Trooping of the Colour ceremony in 1953 with an edge inscription which reads ‘Faith and Truth I will bear Unto You’, taken from the Coronation Oath. The Coronation crown was to form the basis of future Jubilee commemorative crown designs and still remains one of the most sought-after by collectors. It is often the starting point for many great collections. In 1977, Her Majesty celebrated 25 years on the throne – her Silver Jubilee and the first of her reign. To celebrate the occasion, a new commemorative crown was issued by the Royal Mint designed by renowned sculptor and designer of the Queen’s portrait on the UK’s stamps, Arnold Machin. The coin’s reverse design is focused upon the Coronation theme and features the Ampulla and anointing spoon from the Royal regalia surrounded by a heraldic floral pattern and the Crown. 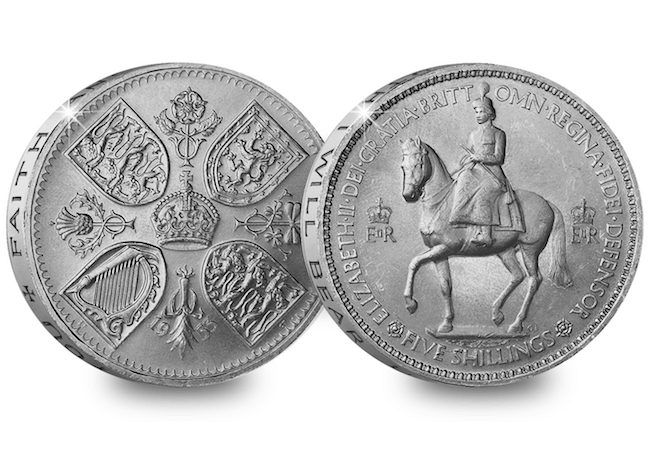 The coin’s obverse takes inspiration from the 1953 Coronation Crown, showing a newly designed image of the Queen on horseback. Unusually, this is the only crown in British history not to feature an edge inscription or date on its reverse and is one of the last crowns to be issued with a face value of 25 pence (commemorative crowns issued after 1990 have a face value of £5), which makes it continually sought-after among collectors. 2002 saw the Queen’s Golden Jubilee, marking her 50th year on the throne and the release of a new commemorative, this time, issued with a face value of £5 . The coin was designed and sculpted by Ian Rank-Broadley FRBS, who created the fourth portrait of the Queen on the obverse of our UK circulating coins. 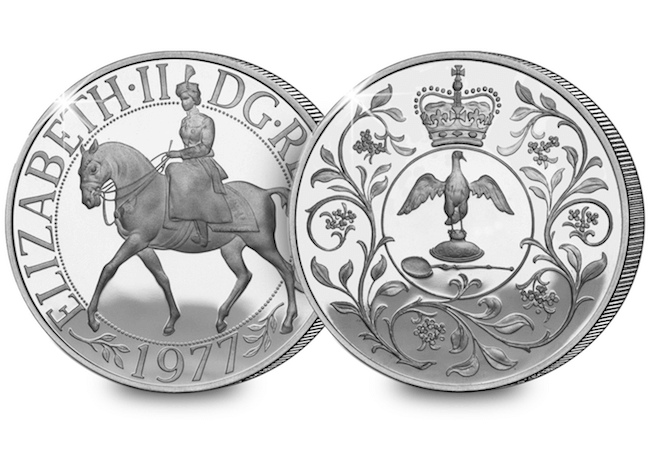 The reverse design once again, features a newly designed image of Her Majesty on horseback inspired by the original Coronation crown design. The reverse features a specially designed portrait of the Queen. In 2012, the nation witnessed the Queen’s Diamond Jubilee. Sixty years on the throne is a landmark milestone and one that has only been reached by one other monarch – Queen Victoria in 1897. This is the first ever coin to be struck to mark a Diamond Jubilee because there were no special coins issued for Queen Victoria’s. To mark such a momentous occasion, Ian Rank-Broadley FRBS was once again commissioned to design the coin. 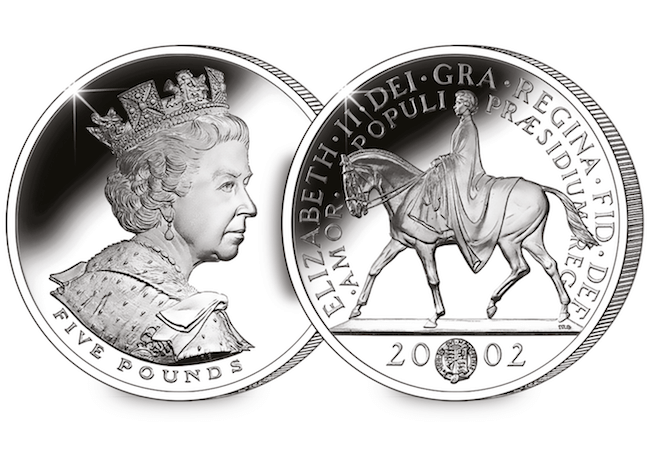 The obverse features a portrait of Her Majesty crowned and wearing the robes of the Order of the Garter, inspired by the sculpture that appears in the entrance of the Supreme Court building in Parliament Square. 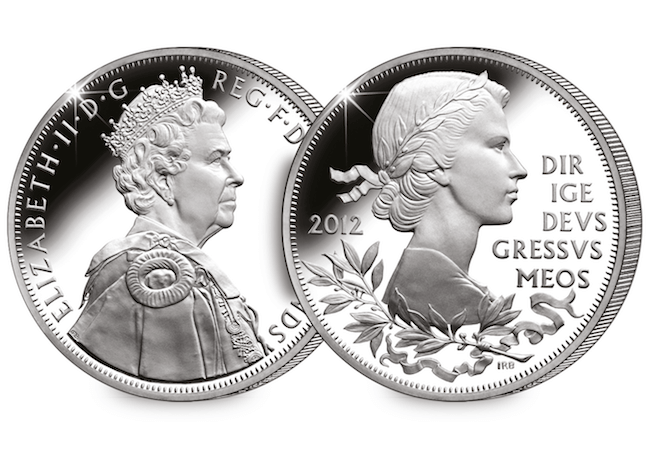 The reverse design shows a portrait of the Young Queen inspired by Mary Gillick’s portrait of Her Majesty, the very first to feature on the obverse of the UK coins in 1953. 2017 marks Her Majesty Queen Elizabeth II’s 65th year on the throne, the first ever British Monarch in British history to do so. To mark such a landmark, historic occasion, this brand new limited edition £5 Proof coin has been issued by the Bailiwick of Guernsey. Fully approved by Her Majesty the Queen, the design by ex-Royal Mint engraver, Michael Guilfoyle features the Sovereign’s crossed sceptres from the Coronation regalia with the number 65 marking the years Her Majesty has been on the throne with a stunning crystal inset into the design representing a blue sapphire. You can now own the new Guernsey Sapphire Jubilee Proof £5 Coin today. With a low edition limit of just 4,950 worldwide in such a landmark year, demand for this limited edition special Proof coin is expected to be high. Prince George appears on a British 1st class stamp issued 21st April 2016 – the first time he will be pictured on our post. The new stamp is part of a special miniature sheet issued to commemorate the Queen’s 90th Birthday, and forms part of a group shot featuring Princes William and Charles, alongside Her Majesty the Queen herself. Photographer Ranald Mackechnie captured the shot in Buckingham Palace’s White Drawing Room, with the aid of a few carefully positioned books to bring the young Prince George into the frame. The miniature sheet harks back to the stamps issued in 2000 for the Queen Mother’s 100th birthday, which also featured a family scene. However this stamp sheet is particularly special, as it is the first time three heirs apparent have posed together in this way. The new stamp sheet will be particularly sought-after by collectors, as philatelic ‘firsts’ like this are always in demand – especially when linked to such an important Royal event. Further adding to the appeal are six more commemorative UK stamps due to be issued simultaneously. Each features a photograph of the Queen from throughout her life, and the images are instantly evocative of her lifetime of service to the country. Suffice to say, this impressive new issue is a fitting tribute to The Queen, and these stamps will make a proud addition to the collection of anyone that wants to mark this landmark Royal occasion. 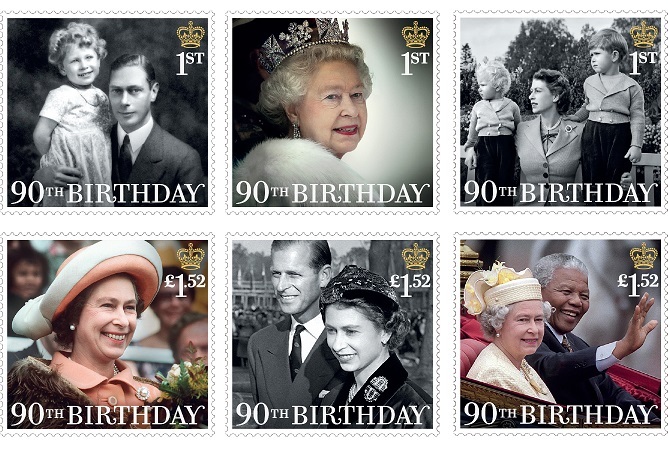 You can own ALL six new stamps, plus the miniature sheet, on The Ultimate Queen’s 90th Birthday First Day Cover. Officially postmarked by Royal Mail on the Queen’s Birthday 21st April 2016, this cover is available to order now.